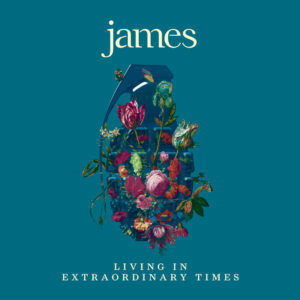 The English-based alt rock band James has turned to a familiar topic throughout Living in Extraordinary Times, their 15th studio album: the current, global political landscape. President Trump and his fellow right wing, nationalist contemporaries in the UK have brought every racism and jingoism to the forefront of everyone’s day to day life, so it’s not surprising that musicians from countless genres are tapping the Grand Wizard In Chief for lyrical inspiration these days. From the lines in “Many Faces” (“There’s only one human race/Many faces /Everybody belongs here”), to the sharp lyrics of “Head,” with laments of fake news and the poor voting against their own interest, Tim Booth crafts his most focused lyrics in years. The album is a mix of the band’s sublime ‘90s alt rock sound with adventurous paths towards a more electronic sound, making for a satisfyingly original album that challenges any preconceived notions that the band is supposed to be little more than a nostalgia act for Gen X. Living in Extraordinary Times manages to offer strong social cometary while avoiding the preaching clichés. At this rate, Trump is on record to inspire more albums than the Reagan and W. Bush administrations combined.